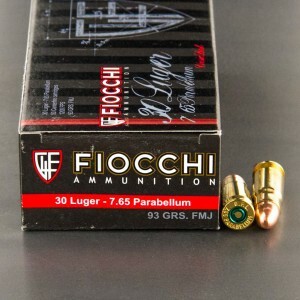 .30 Caliber Luger ammo or the 7.65 Parabellum, is a 7.65x21mm cartridge that was designed in 1898. The 30 caliber Luger cartridge was originally designed to improve of the current service pistol of the day. The Luger was designed based upon Georg Luger’s 30 Luger cartridges to present a modern military pistol that was ergonomic and easy to use. These are bottle-necked pistol rounds that despite their bottleneck nature, feed extremely reliably in most firearms. It’s important to note when dealing with surplus 30 Luger two loads were made, one for used in pistols and one for use in carbines and sub machine guns. The load for carbines and sub machine guns is much hotter that the pistol load and is not suggested for use in the older Luger pistols. While the Luger and its variants are often thought of as a German caliber and often on the opposing side of the United States this isn’t true. Both Switzerland and Finland adopted 30-cal Luger ammo for use in the Luger pistol. In the First World War the round found itself on both ends of the war, in several different and distinct firearms. Eventually the caliber was found in the Sig P210, and the Astra A-80, with the Sig being a popular choice among American civilian shooters today. The 30 caliber Luger is often revered by purists for its unique history and for being the original Luger chambering. 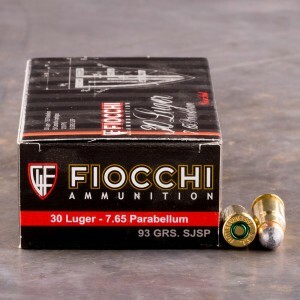 This ammo is known for being a flat shooting round and exceptionally accurate, and when combined with the ergonomic Luger pistols make an exceptionally accurate combination. This ammo is the only one I have found to function reliably in a vintage Luger pistol! Better than the same brand FMJ. This is a very good ammo. Not one misfire from this ammo. Great product, great price, and great seller.